I'm back from a wonderful family winter vacations and having experienced freezing cold temperature at -9 degree Celsius as well as highly polluted air quality of PSI 500, am I glad to be home! My oven has rested well too for the past one month and it is all ready for moi to work it hard again...lol! Here's sharing my new experiment and recipe of a roll cake which I have transformed into a Christmas log cake for my church Caregroup gathering last weekend. My friends who were my 'guinea pigs' gave thumbs up for it and they love the smooth, soft and bouncy cake texture. They told me that they have not tasted such nice roll cake texture before and they also love the chocolate and coffee cream fillings which is light and not too sweet. My hubby who hardly praises also commented that this is the best roll cake I have made so far! As I was rushing to attend the gathering, I didn't have time to take out my DSLR camera to take some nice shots of the cake, only manage to snap one photo of the completed cake with my mobile phone. 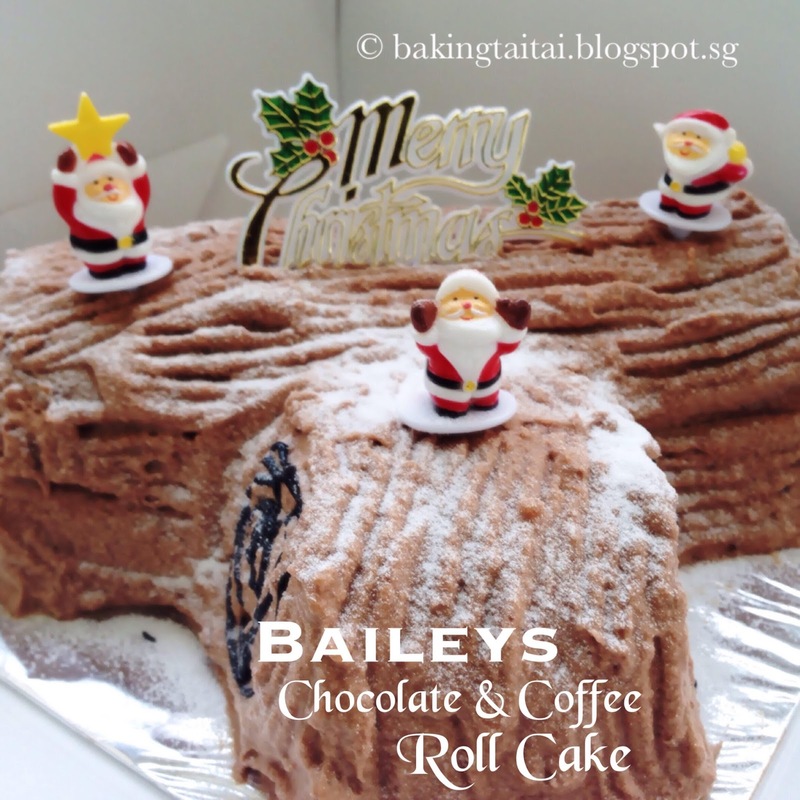 I highly recommend you to give this cake a try and here's wishing everyone a Blessed and Joyous Christmas! 1. Mix the coffee powder well with hot water, then add in the Bailey's coffee liqueur, mix well and set aside. 3. Mix in the sifted flour in 2 additions into the egg yolk mixture till no flour is seen. 4. Add in the coffee and liqueur mixture, mix well and set aside. 6. Add the meringue into the egg yolk batter 1/3 at a time, each time gently mixed well before adding the next. 7. Pour the batter into the baking pan laid with baking paper and smoothen the surface. 9. 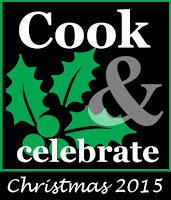 Remove the cake from the oven, transfer to a wire rack, peel open the sides of the baking paper to cool the cake. Put another piece of baking paper on it, flipped it over and peel off the top baking paper. 1. In a bowl, sprinkle gelatin powder (without stirring) into water, put aside for 10 minutes for grains to swell before setting the bowl over a bowl of hot water. Stir with a spoon until gelatin melts. 2. Mix the gelatin solution well with a little whipping cream before mixing with the rest of the whipping cream. Use an electric mixer to beat the whipping cream till firm peak, set aside in fridge. 4. Remove the whipping cream from the fridge, pour in the hot melted chocolate immediately and mix quickly till well combined. Then add in the chocolate liqueur, mix well. 5. Spread the cream evenly on the cake surface before rolling it up. (depending on your room temperature, if the cream melts too fast, you may put it in the fridge to harden a little before spreading) Wrap the whole cake with baking paper and put into a plastic bag before putting it into the freezer to chill hard before cutting into pieces to serve. NOTE: You may skip the following step if you are not transforming it into a log cake. 1. Use an electric mixer to beat the whipping cream and sugar till firm peak. 2. Mix in the chocolate cream together with coffee and chocolate liqueur. Hi,if I were to use my 10"×10" square pan, is it I reduce your recipe by half? Tks for ur reply. Hi, I got it from DFS store. If you really can't find the chocolate luxe or coffee flavoured ones, you can replaced it with Baileys Original or Kahlua. Hi, please use the 'Pan Conversion Tool' under Useful link which can found at the right column of my blog to adjust the ingredients amount to suit your baking pan. Happy New Year to you & family, Cheryl. May many more good things coming your way dear. God blessed. Hi Kristy, a blessed New Year to you and family too! Wishing you a bountiful year and God bless! Hi Zoe, a blessed New Year to you too! Sorry for not visiting, due to my super busy schedule, I hardly have time for blog hopping these days. @LoveToCookAndBake, you can use any flat pan, just convert using the ‘Pan Conversion Tool' found under Useful Link at the side bar. Rolling the cake when it is warm will prevent cracking.